The Korean War Veterans Memorial was confirmed by the U.S. Congress (Public Law 99-572) on October 28, 1986, with design and construction managed by the Korean War Veterans Memorial Advisory Board and the American Battle Monuments Commission. 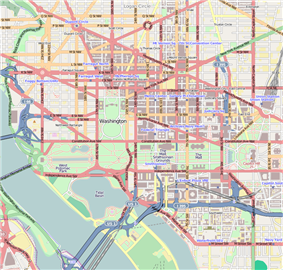 The initial design competition was won in 1986 by a team of four architects from The Pennsylvania State University, but this team withdrew as it became clear that changes would be needed to satisfy the advisory board and reviewing agencies such as the Commission of Fine Arts. A federal court case was filed and lost over the design changes. The eventual design was by Cooper-Lecky Architects who oversaw collaboration between several designers. President Cold Spring Granite Company, the Tallix Art Foundry and the Baltimore District of the US Army Corps of Engineers.... The memorial was dedicated on July 27, 1995, the 42nd anniversary of the armistice that ended the war, by President Bill Clinton and Kim Young Sam, President of the Republic of Korea, to the men and women who served during the conflict. Management of the memorial was turned over to the National Park Service, under its National Mall and Memorial Parks group. As with all National Park Service historic areas, the memorial was administratively listed on the National Register of Historic Places on the day of its dedication. Within the walled triangle are 19 stainless steel statues designed by Frank Gaylord, each larger than life-size, between 7 feet 3 inches (2.21 m) and 7 feet 6 inches (2.29 m) tall; each weighs nearly 1,000 pounds (500 kg). The figures represent a squad on patrol, drawn from each branch of the armed forces; fourteen of the figures are from the U.S. Army, three are from the Marine Corps, one is a Navy Corpsman, and one is an Air Force Forward Air Observer. They are dressed in full combat gear, dispersed among strips of granite and juniper bushes which represent the rugged terrain of Korea. To the north of the statues and path is the United Nations Wall, a low wall listing the 22 members of the United Nations that contributed troops or medical support to the Korean War effort. 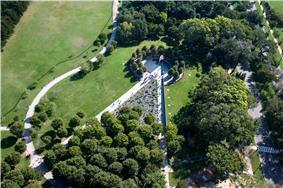 The circle contains the Pool of Remembrance, a shallow pool 30 feet (9 m) in diameter lined with black granite and surrounded by a grove of linden trees with benches. The trees are shaped to create a barrel effect, which allows the sun to reflect on the pool. Inscriptions list the numbers killed, wounded, missing in action, and held as prisoners of war, and a nearby plaque is inscribed: "Our nation honors her sons and daughters who answered the call to defend a country they never knew and a people they never met." Additionally, right next to the numbers of American soldiers are those of the United Nations troops in the same categories. In the south side of the memorial, there are three bushes of the Rose of Sharon hibiscus plant, South Korea's national flower. A further granite wall bears the simple message, inlaid in silver: "Freedom Is Not Free." Engraved on granite blocks near the water pool at the east end of the monument are the casualty statistics for the soldiers who fought in the war. Wounded — United States: 103,284, United Nations: 1,064,453. Captured — United States: 7,140, United Nations: 92,970. Missing — United States: 8,177, United Nations: 470,267. The unveiling of the stamp at the center of Frank Gaylord's intellectual property dispute. On February 25, 2010, the United States Court of Appeals for the Federal Circuit ruled on appeal that the memorial sculptor Frank Gaylord was entitled to compensation for a 37 cent postage stamp which used an image of the sculpture because he had not signed away his intellectual property rights to the sculpture when it was erected. The appeals court rejected arguments that the photo was transformative. 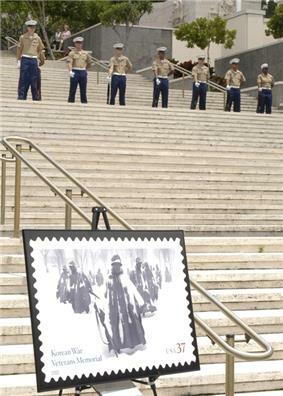 In 2002, amateur photographer and retired Marine John Alli was paid $1,500 to use one of his photographs of the memorial on a snowy day for the stamp which sold more than $17 million worth of stamps. In 2006 sculptor Frank Gaylord enlisted Fish & Richardson to make a pro bono claim that the Postal Service had violated his Intellectual property rights to the sculpture and thus should have been compensated. The Postal Service argued that Gaylord was not the sole sculptor (saying he had received advice from federal sources – who recommended that the uniforms appear more in the wind) and also that the sculpture was actually architecture. Gaylord won all of his arguments in the lower court except for one—the court ruled the photo was fair use and thus he was not entitled to compensation. Gaylord challenged the fair use ruling and won the case on appeal. The case could now either be appealed to the United States Supreme Court, or damages could be assessed by the United States Court of Federal Claims. Gaylord had sought compensation of 10 percent of the sales. Gaylord's original commission was $775,000. On April 22, 2011, The US Court of Claims awarded Gaylord $5,000. On September 20, 2013, The United States Court of Federal Claims awarded Gaylord $684,844.94 in damages. ^ "U.S. Corps of Engineers, Baltimore District, Korean War Memorial". Nab.usace.army.mil. Retrieved 2012-12-17. ^ "Korean War Memorial". American Battle Monuments Commission. Korean War Memorial. Retrieved 28 October 2015. ^ "Korean War Veterans Memorial, Washington, D.C". Nab.usace.army.mil. Retrieved 2012-12-17. ^ "U.S. Army Corps of Engineers - Baltimore District - Projects - Korean War Veterans Memorial, Washington, D.C". Nab.usace.army.mil. Retrieved 2012-12-17. ^ "Korean War Veterans Memorial". American Battle Monuments Commission. Retrieved 2013-06-21. ^ Shane, Leo (12 October 2015). "Korean War Veterans Memorial Gets $1M Donation from Samsung". Military Times. Retrieved 28 October 2015. ^ The ABRAM (American Battlefield Monuments Commission) MIA. The more commonly used number–36,516–only includes the deaths that occurred as a direct result of the Korean War. ^ 664 is the current number defined as living missing personnel of the end of the war. ^ a b "An 85-Year-Old Sculptor vs. The Government – amlawdaily – February 25, 2010". Amlawdaily.typepad.com. Retrieved 2012-12-17. ^ Mike Doyle (April 25, 2011). "Korean War memorial sculptor wins and loses at the same time". McClatchy. 15 photos at "Sites of Memory"
Steel sculptures in Washington, D.C.